Astronomers using a world-wide collection of radio telescopes, including the National Science Foundation's Very Long Baseline Array (VLBA) of the National Radio Astronomy Observatory (NRAO), have made a dramatic "movie" of a voracious, superdense neutron star repeatedly spitting out subatomic particles at nearly the speed of light into two narrow jets as it pulls material from a companion star. The movie shows these jets ejecting clouds of hot plasma that are then "zapped" by pulses of energy in the jets as they move away from the neutron star. "We have directly measured the speed of energy flow in a cosmic jet for the first time," said Ed Fomalont, an astronomer at the NRAO in Charlottesville, Virginia. Fomalont worked with Barry Geldzahler and Charles Bradshaw of George Mason University in Fairfax, Virginia. The astronomers used the VLBA, the NSF's Very Large Array (VLA) and the Green Bank 140-foot telescope, along with radio telescopes from the European VLBI Network, Australia, Japan and South Africa to record the double-star system's eruptions continuously for 56 hours. "This study is going to be extremely valuable in helping us understand a phenomenon that we see throughout the universe," Fomalont said. Cosmic jets of superfast particles are ejected from the cores of numerous galaxies. On a smaller scale, similar jets are ejected from binary-star systems closer to home, in our own Milky Way Galaxy. While the jets from galaxy cores are thought to be powered by supermassive black holes millions of times more massive than the Sun, the closer "microquasars" are powered by much smaller black holes or by neutron stars only a few times more massive than the sun. "Studying one of the closer, smaller examples will help us understand how they all work, including the bigger ones," Geldzahler said. "The jets coming from distant galaxies are harder to study because of their much greater distance and the slowness of their evolution. The changes we saw in an hour take thousands of years in the distant galaxies," he added. The astronomers observed Scorpius X-1, a system consisting of a neutron star roughly 1.5 times the mass of the sun and a "normal" star about the same mass as the sun. The two, more than 9,000 light-years from Earth in the constellation Scorpius, orbit each other every 18 hours and 53 minutes. Scientific instruments aboard a brief rocket flight over New Mexico in 1962 revealed that X-rays are coming from the system, and the pair of stars has been observed extensively since then. For the latest study, whose results are published in the May 20 issue of the Astrophysical Journal Letters, Fomalont, Geldzahler and Bradshaw used telescopes around the world to make highly-detailed radio images of the ejections. As the object went below the horizon for one set of radio telescopes, it was rising for the next set, allowing continuous imaging for the 56-hour period. In the U.S., the astronomers used the VLBA, a network of 10 radio telescopes spread across U.S. territory from Hawaii to the Virgin Islands. 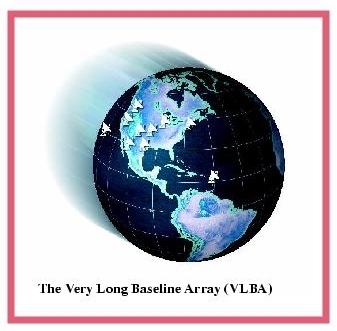 They also used the European VLBI Network, including telescopes in the United Kingdom, Italy, Poland, Spain, Sweden and the Netherlands, plus a telescope in South Africa and one at the NRAO in Green Bank, WV. In addition, they used the Asia-Pacific Telescope Array which included five telescopes in Australia, plus telescopes in China, Japan and South Africa. "To keep watching this thing as the Earth turned, we had to use most of the major radio telescopes in the world, and the necessary coordination took months to organize," Fomalont said. At the same time, two optical observatories, Braeside Observatory and the Steward Observatory 90-inch telescope on Kitt Peak, and the orbiting Rossi X-ray Timing Explorer observed the object. "These observations tell us what is happening near the neutron star and the accretion disk" said Bradshaw. "All of the energy in the jet and the radio source is produced from this small region." The individual radio telescopes were combined into larger "virtual telescopes" capable of producing extremely detailed images. The "movie" of Scorpius X-1 consists of images showing detail roughly equivalent to being able to read a newspaper in Los Angeles from the distance of New York. Cosmic jets, most astronomers believe, arise when a massive object, such as a neutron star or a black hole, draws in material. Instead of being sucked directly into the massive object, the material first forms a whirling "accretion disk" that closely orbits the central object. Friction within the accretion disk can heat it to temperatures so hot that it radiates X-rays. Excess energy also is vented by ejecting subatomic particles from the poles of the disk at speeds nearly that of light. "These things are tremendous particle accelerators, propelling huge amounts of matter at fantastic speeds. Unfortunately, we don't understand the physics of how they work very well at all. That's why we're so excited to have this 'movie' of extremely detailed images to help us figure out what is really going on in this system," Geldzahler said. "Ed and I have been studying Scorpius X-1 for nearly 20 years and we finally got the resources to probe deeply into its evolution." 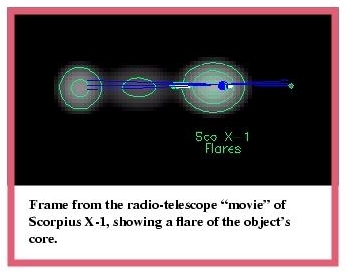 During the 56 hours in June of 1999 when the astronomers were observing, Scorpius X-1 cooperated by being very active. The object's core, near the orbiting pair of stars, showed changes in the brightness of its radio emission. In addition, "lobes" of bright radio emission were pushed outward by the jets at about half the speed of light. These lobes, the scientists think, are produced when the fast moving particles in the jet, created from the accretion disk, collide with the surrounding interstellar material caught in the flow. Near the beginning of the movie, one moving set of lobes disappeared, but new lobes were ejected from the core a few hours later and proceeded outward. The movie also shows Einstein's relativity in action. Although two clouds are pushed by the jets in opposite directions away from the core, the cloud moving toward the Earth appears to be 15 times brighter and moving two times as fast as the cloud moving away from us. "We believe that both clouds are similar and the difference that we see is just a relativistic illusion caused by their fast motions," said Fomalont. Twice, the core flared in brightness as it shot a burst of electrons outward at more than 95 percent of light speed. As this burst reached the lobes, the collision of the fast electrons with the lobe material caused the lobes to brighten. The exquisite detail and continuous formation of the radio images allowed the scientists to directly measure the speed of the fast electrons in the beam, marking the first time ever that the speed of energy flow in such a cosmic jet has been measured. "Scorpius X-1 put on a great show for us. Now it's up to us to figure out how it performs its act," said Fomalont. NOTE: Your browser window should be at least as wide as the above line to view the movie.